Family separation can be crippling - both financially and emotionally. Conflict can have profound and lasting effects on children. Mediation is one way to help minimize family trauma, reduce the financial burden of separation, and support the established legal principle of putting the "best interests of the child" first. Access Pro Bono wants to make mediation services available to people who are not otherwise able to afford them. In this eNews article, Priyan Samarakoone, Access Pro Bono’s Program Manager, describes the project. “About 40% of marriages in Canada end in divorce, while unmarried relationships are increasing. The cost to a family of a contested divorce averages about $20,000 and can be substantially higher. Many people start with a lawyer but can’t continue to pay them and end up conducting their own cases. In some family courts, 60-70% of litigants are self-represented. Children subjected to parental conflict are at higher risk of loss of effective parenting, disrupted crucial parental attachments, altered neurochemistry, and reduced intellectual development. The younger the child, the more severe and lasting the negative effects can be. Children’s ability to thrive following separation is directly linked to their parents’ ability to communicate, focus on the child’s needs and work effectively together. Mediation is better than litigation for fostering these skills. One longitudinal study found that parents who had mediated had better relationships with their children than parents who had litigated. Mediation allows both partners to make decisions regarding the ultimate arrangement. The project will use mediators certified by the Law Society of BC and their job will be to help people discuss options and, if possible, reach agreement. 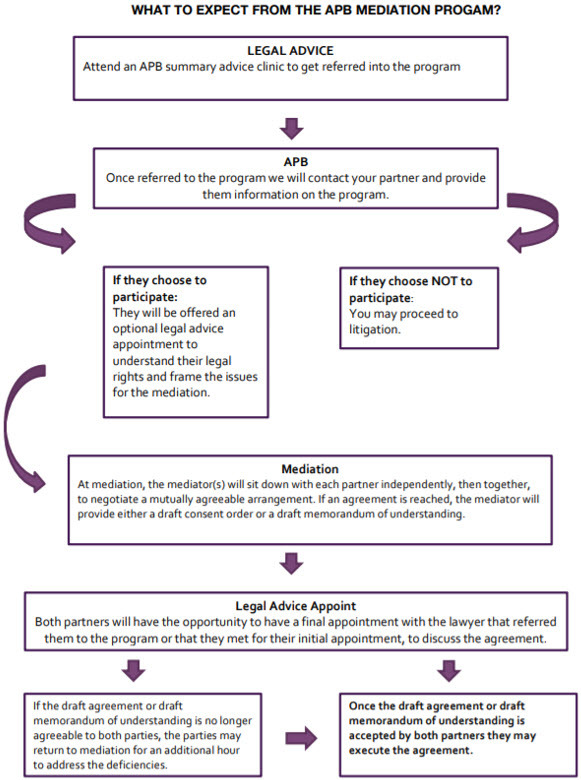 Access Pro Bono Mediation is free. It is also quicker than litigation. The goal is to draft a mutually agreeable arrangement in a single mediation session spanning up to 3 hours. To be eligible clients must meet the Access Pro Bono income criteria and be subject to an asset/equity test. The program will try to be flexible to ensure that we provide as many clients as possible with our mediation service without infringing on private mediation services. The program is currently operating only in the Greater Vancouver Regional District, although Access Pro Bono hopes to expand it in the future. •	Call or email Access Pro Bono at 604 482 3195 ext 1526 or familymediation@accessprobono.ca to provide information on your situation. •	The Mediation Coordinator will contact you and the other party to explain the process and answer your questions. •	Mediation is possible only if all parties agree to participate. You will both need to sign an Agreement to Mediate form. •	Each party will receive advice from a family law lawyer. •	Mediation is then scheduled with a BC Law Society accredited mediator. •	You will meet with the other party and a mediator for up to 3 hours. •	If you and the other party reach agreement, you will each will receive independent legal advice before signing an agreement.